The Catholic University community marked the ninth anniversary of the 9/11 terrorist attacks on Friday, Sept. 10, with the reading of the names of the 2,974 people who died that day. 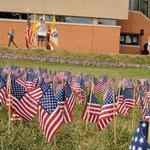 A collection of small U.S. flags on the Edward J. Pryzbyla University Center lawn commemorated those who were killed. Students recited poems and readings and the ceremony closed with a candlelit vigil.